Mentor Sheila Bias (left) talks with mentee Lexi Harris on Main Street, downtown Columbia. The program ensures that every student has a chance to be paired with an experienced attorney who can help them navigate their way through law school and into the professional world. And since its inception in 2010, it has changed the lives of both mentors and mentees. Lexi Harris, a first-year student at the School of Law, is pretty sure she would have thrown in the towel midway through her first semester had it not been for her mentor. Harris considers herself fortunate to have been assigned 2011 alumna Sheila Bias as her mentor during Introduction to the Legal Profession, a required class for all 1Ls. Bias began volunteering with the School of Law’s mentoring program because of her personal experience with mentors, both as a student and as a lawyer. “I didn’t have any lawyers in my family or circle of friends when I began law school, so I relied on unofficial mentors to help navigate professors, exams, job searches, networking and professionalism,” she said. Now an attorney with Fisher and Phillips LLP, Bias continues to seek out her mentors’ advice, as she did when she transitioned to employment law after working as a staff attorney for the Supreme Court of South Carolina. “Among other things, one of my mentors offered suggestions on researching firms and negotiating incentives, and she encouraged me to consider options that I never would have otherwise,” Bias said. “I credit her for much of where I am in my career and for the person and attorney I have become. From the start, Harris said Bias treated her as if they were already peers. And that’s not an accident. 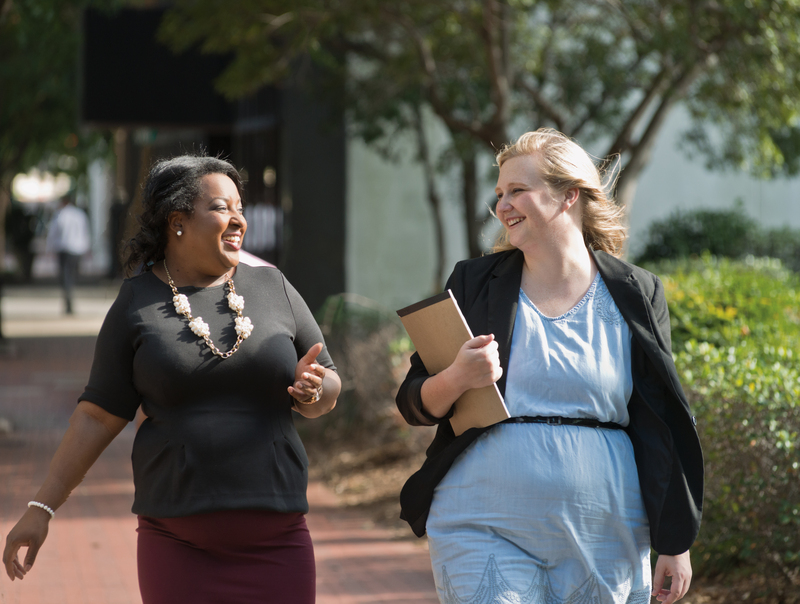 To that end, the School of Law curriculum requires the Introduction to the Legal Profession course, as well as optional yearlong one-on-one mentoring for 3Ls in partnership with the Young Lawyers Division of the South Carolina Bar. In her search for quality mentors, Williams seeks both new and experienced lawyers who are able to act as coaches, motivators, teachers, counselors or confidants — whatever an individual student needs. And Harris is a happy recipient. “She met me one-on-one for lunch, and our group met at places outside of school where we could just engage in small talk. There was much more laughter and chatting than I would have thought possible,” she said. Approximately 110 lawyers and judges are needed each year to volunteer as mentors to School of Law students. Interested in becoming one? Contact Sharon Williams at 803-777-7785 or scwillia@mailbox.sc.edu to see how you can become involved.